Located in Carbon County, outside of Wellington (Route 6/191), Utah. An 80 mile road (50 miles west to east; 30 miles south to north); NO services available; private ranches (RESPECT private property/no trespassing signs); touring is FREE; take ALL trash with you; do NOT desecrate rock art and ruin sites. Set odometer to zero when turn made onto road to Nine Mile Canyon (from Route 6/191 onto Soldier Creek Road – currently a Chevron Station on the corner). Mileage may vary 1/10th to 2/10ths from mile markers due to curvature of the roadway; many sites are 50 to 100 feet upwards (approximations), so be prepared to park, exit vehicle and look. There will also be signatures with dates going back to the 1880s of pioneers, ranchers and visitors coming through the area. Many signatures are included as simply reference points of location. Do NOT leave your mark! 12.7 – Mine Buildings and Offices; north side. 24.0 - Nine Mile Ranch and Campground; south side (odometer read 23.8). 26.4 – Columns of lines – natural weathering or carved? 26.7 – First Site (rock art site); north side. 27.3 – Wooden log bench to enjoy the view. 27.7 – Cottonwood Glen Picnic Area; south side. 30.2 – Weathered wall resembling human figures; snake inside largest figure; north side. 30.6 – “James 1924”; north side. 30.8 – Human and Mountain Goats; north side. 30.9 – “Rob Powell 1881”; north side. 31.3 – “GB 1934”, “1883”, Man pulling horse with rider; north side, ground level. 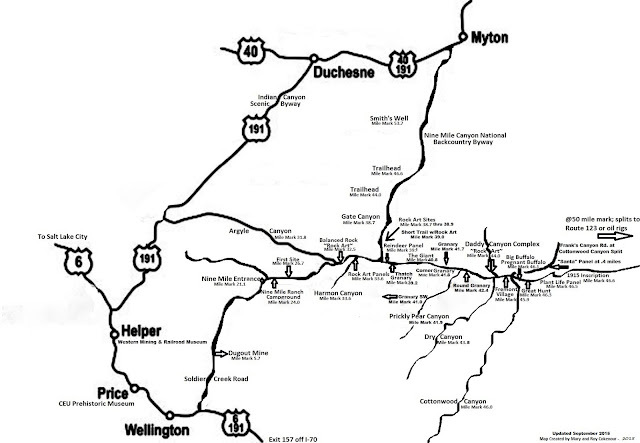 31.8 – Argyle Canyon, road travels northwest to Route 191; rock art half mile on eastern wall. 32.0 – Series of dots forming a rectangular pattern; north side, 30 feet up. 32.1 – Deer Panel; north side, approx. 100 feet up. 32.2 – Snake figure; north side, approx. 150 feet up. extending back from Balanced Rock; includes “The Juggler”. 32.7 – Snake and Dot Panel, “TC 92”; north side. 32.9 – “6th Infantry 2/2/86”, Long Neck Horse; north side. 33.3 - Abandoned Homestead, rock art panel behind old truck, north rock wall. 34.3 – “Towers” rock formation up on south mesa; Snake on north side, approx. 200 feet up. 34.5 – Centipede; north side, 75 feet up. Fasselin Ranch – no trespassing). colds, go to Doc Lunt, Nephi”, north side, approx. 50 feet up. 35.2 – Jagged Line and Snake plus panel of various artwork; north side, approx. 200 feet up. 35.5 – Panel of Animals; north side, approx. 50 feet up. 35.7 – Snowflakes, Hunting Scene; north side, approx. 50 feet up. 35.9 – Three Panels of Patterned Lines, Cranes (birds), Goats; north side, approx. 100 feet up. 36.1 – Oddly shaped curved figure, Bug-like shape, “Bug Man”; north side, approx. 50 feet up. ledge; north side, 100 feet up; Rattlesnake below at 50 feet up. 36.4 – Signatures from 1881, 1888, 1893 plus rock art; north side, ground level. 36.5 – Five separate panels featuring man with headdress, hand print, animals; north side, approx. 36.6 – Triple dot marking on east wall of canyon; man with horns and spirals on north side, approx. 36.7 – Series of small circles; north side, approx. 30 feet up. 36.8 – Faded rock art, signatures dating 1916, 1928, 1964 – north side, ground level. north side, approx. 50 feet up. 37.1 – Modern Graffiti; north side. Prime Example of Desecration. 37.2 – Five panels of various rock art; north side, approx. 30 feet up. 37.3 – Bisected field and Deer; north side. 37.6 – Carvings of Spirals and Geometric Shapes; Spider/Snowflake and Lizard; north side. 37.7 – Spiral, “BP”; north side, ground level. 37.9 – Faded Long Neck Deer (giraffe like); north side, ground level. 38.0 – Slanted lines, small deer and stick-like figure; north side, ground level. 38.1 – Faded circle and Elk; east wall, 30 feet up. fencing; Nutter Ranch buildings on south side. 38.7 – Just before Gate Canyon Road; set of parallel lines, 2 squiggly figures; north side, 100 feet up. 38.7 - Rock art past the road of Spirals and Mountain Goats; north side, 300 feet up. 38.8 – Two sections of Rock art; north side approx. 6 feet from ground level, behind bushes. 38.9 – Two panels: Rainbow, Circles with Lines; Field with Man; north side, 30 feet up. 39.1 – Reindeer panel; north side, approx. 30 feet up. mountain goat at ground level. 40.1 – Man on Horse chasing a deer; north side, ground level. 40.4 – “10-31-1956”, faded mountain goat; north side, 30 feet up. level; around corner, 50 feet up on west wall – full pueblo drawing with “horned” figure. 40.9 – Faded panel of small figures; north side, ground level. 41.0 – Granary high up on southern wall; park in parking area, look up and southwest. 41.3 – Spiral, human and deer figures; north side, ground level and right of cattle gate. 41.6 – Spirals, Men with Bows and Arrows; north side. 41.7 – Granary almost at ground level; north side. 41.8 – Ground level stone walls and fire ring; “cowboy camp”; north side. lizard, granary tucked under its “chin”); north side at ground level is Man riding a bull. 41.9 – Prickly Pear ATV Trail; southward. 42.4 – Round Granary (timber visible) high up on wall at edge of ledge; look up and northeast. 43.1 – Snakes, Goats, X on far north wall; Rock formation to left forms small arch; north side. 43.7 – Carving of House (modern graffiti? ); north side, ground level. 43.8 – Dry Canyon ATV Trail, road travels southward. trespassing” warning over red deer/elk; north side. leads to more rock art sites; restroom facilities available on south side of road. 44.8 – Spiral and more; north side, ground level. Pit House; buried Kiva passed along way (overlooks main road). 46.0 – Frank’s Canyon to the left of split, road travels northeast. - 4/10ths of a mile, stop at open fencing, look upwards 100 feet for the “Santa” Panel. - 5/10ths of a mile, horned figure, deer, snake with dots over top and bottom. - 8/10ths of a mile, snake with dots going through it. 46.0 – Cottonwood Canyon to the right of split, road travels southeast. Pregnant Buffalo located on wall behind fenced in area (Access Closed). 46.5 – “Plant Life” Panel; south side. aware of oil company vehicles. This Legend was created by Mary and Roy Cokenour, Monticello, Utah (2015). To View Photographs of Nine Mile Canyon, go to: http://southwestbrowneyes.com/ , Utah Tab, Scroll Down to Miscellaneous Counties, click onto various Nine Mile Canyon links. These photographs are the property of the Cokenours, and cannot be reproduced without written permission.